A marketing dashboard is a compilation of all of the pertinent data about a company’s marketing efforts. Marketing dashboards benefit both marketing and the executive team. They can give an at-a-glance view that quantifies the overall impact marketing has on the business and how marketing initiatives increase customer acquisition, retention, and sales. A marketing dashboard can be invaluable for making strategic decisions and adjustments to your sales funnel. Creating the right digital marketing dashboard in 2018 is a difficult process mainly because of the complexity of the digital marketing space. You have social media stats you need to track for Twitter, Instagram, Facebook, etc. You have Google Analytics and Search Console that operate as your primary web analytics data source, and you’ll be tracking SEO performance with SERP Rank Tracking Tools and you’ll be generating Site Audit data to monitor the performance of each of your marketing pages. Depending on your particular campaign you’ll be using different key metrics, and you’ll be adjusting KPIs based on the tools you use (for instance, if you use something like CallRail you may be tracking data on phone calls, while some companies choose to not track call metrics). Your KPIs are fairly straightforward, but depending on what current marketing strategy you are using, your reports will be tracking different metrics. To build an effective dashboard the most important step is to define your audience. Data Dashboards and Data Visualization, in general, is designed to tell a story, so you need to know who is listening to your story. A well-designed dashboard tells a compelling story that links to actionable KPIs that benefit the viewer. Different audiences will require different dashboards. 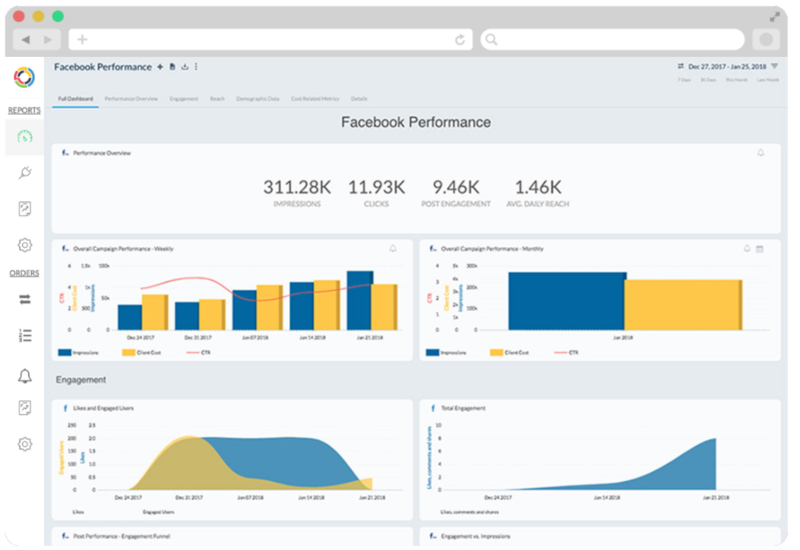 An executive needs a dashboard that summarizes performance metrics so they can make informed business decisions; a dashboard for a social media marketer will need a social media dashboard to consolidate all metrics from sites like Twitter, Facebook, Google+, LinkedIn, so they can get detailed data on key social metrics. We’ve even created a social media infographic to aid social media marketers as they craft and visualize their key metrics. Suffice it to say, depending on your particular position within a marketing agency, you could be tracking entirely different KPIs. Different Marketing dashboards can tell a different story and it is important to establish the objectives of each of your dashboards. Determine short-term and long-term objectives of your stakeholders and build different views of data at different levels of granularity. As an example, an executive might want to look at a high-level dashboard that provides an overall return on investment and budget. If you’re interested in executive dashboards, we’ve written an executive dashboard guide to provide even deeper insight into proper visualization. An analyst, on the other hand, will want a detailed view of the data to take tactical decisions. An important thing to remember while creating Marketing Performance Dashboards for your stakeholders is to tell a powerful story that provides a path for immediate action. The goal isn’t to visualize data because it looks cool. The goal is to understand your data better. Provide insights and connections between various elements of your marketing strategy to demonstrate ROI and opportunities for improvement. It is important to determine what metrics are important for your specific marketing strategy (and its even more important as an agency to understand what strategy to use). These KPIs can include marketing performance metrics of each program or campaign such as likes, clicks, dwell time, traffic, click through rate, etc. A KPI can also include the marketing impact metrics that tie performance to business goals like conversions, increase in brand value or increase in sales. These KPIs once identified can be analyzed across various dimensions like date and source of data so you can provide insights to your team and to the heads of marketing. Determining your marketing KPI is important as it allows for you to track and convey your own value and the value of your team’s efforts in the areas that matter. You could be getting tons of clicks, but are clicks key performance indicators? It all depends on your particular role within the company and your particular objective in a marketing campaign. Don’t copy and paste the same KPIs for every marketing effort. Tailor your analytics dashboard to the personalized KPIs of each marketing campaign (campaigns can often have the same KPIs but not always). New marketing platforms have made it easier for business owners and marketing teams to manage everything from their website, email marketing, call tracking, to their social media strategy. Each of these data sources will have their own set of metrics and data and it is important to consolidate them to a single platform to easily measure the performance of marketing programs. With all of this data, its tempting to include everything in one dashboard. Pro Tip: Don’t be guilty of information overload. Determine the metrics that matter and the data sources you want to use to gather the defined metrics. Marketing Analytics tools can provide you with countless amounts of data and it’s important that you convey the right message (because your visuals can easily convey a message you haven’t intended to convey) with your marketing analytics dashboard. Make sure its easy for everyone on your marketing team to create and consume data that encourages data discovery and analysis. The real value in visualizing all of your marketing data is that you’ve given your marketing team the tools that are necessary for understanding all of this data while enabling yourself to find additional insights that may not be found if the data was kept in its nascient CSV format. Today a marketing team uses hundreds of tools that contain a myriad of metrics. A very important objective of any analytics dashboard is to consolidate and integrate data into a consistent view using some sort of visualization tool. A consolidated marketing dashboard should combine these multiple data sources into a single source that should also be connected to outcomes and ROI. Make sure you use a tool that can integrate all of your data. You miss out on the immense value of data visualization if you don’t have reporting tools capable of weaving together the right story and you’re missing chapters in your book if you leave out important data sources simply because you haven’t integrated all of your data. We hope this small guide helps you with your marketing dashboards. TapClicks has a ton of resources on our blog. Check out more of our marketing dashboard guides if you’re trying to get a more detailed description on best practices for certain kinds of marketing campaign visualizations.